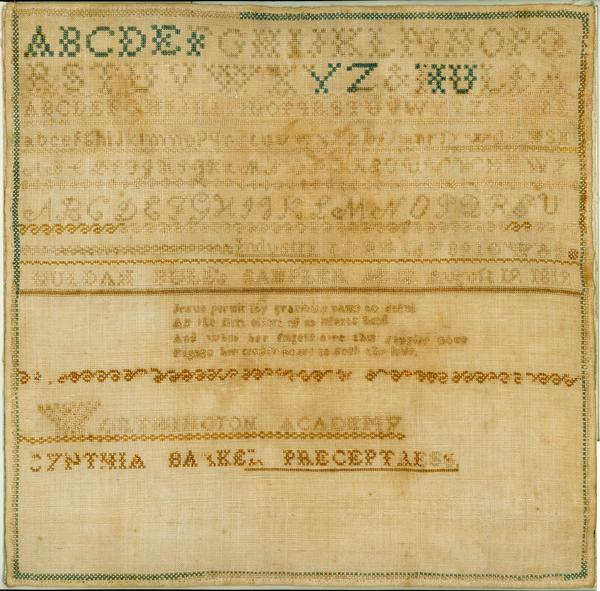 Linen Sampler from the collections of the Worthington Historical Society (WHS) may be used for educational purposes as long as it is not altered in any way and proper credit is given: "Courtesy of the Worthington Historical Society, Worthington, OH." Prior written permission of the WHS is required for any other use of Linen Sampler. Contact WHS at info@worthingtonhistory.org to request permission. Linen Sampler is realia. Its dimensions are 16 in. x 15.75 in.. It was created on Wednesday, August 19, 1812. A linen sampler made by Huldah Bull, age 12, at the Worthington Academy. Needlework was an important part of a girl's education in addition to literacy, numeracy, music and dancing. As most clothing was made by hand, the ability to do needlework of both the practical and ornamental type, or plain and fancy, were vital parts of a girl's education. The word 'sampler' comes from the Latin 'exemplum', meaning a model or example. The sampler's purpose was to provide examples of the different stitches that might be needed by the embroiderer in the future. The alphabets and texts or poems showed proficiency in other parts of the curriculum. This sampler is done in cross-stitch using cotton floss of different colors, five embroidered alphabets and a religious verse. Cynthia Barker was preceptress at the time. It features the organization Worthington Academy. The Worthington Memory identification code is whs0410_001. This metadata record was human prepared by Worthington Libraries on March 14, 2002. It was last updated November 17, 2017.